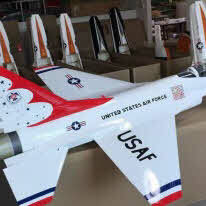 TOPRC Full Composite F-16 Thunderbird 1/6 edition. Wing span (spanwijdte) 1630 mm 65"
Check the instruction Manual for a detailed instruction about the Turbine engine mounting etc. More than 95% assembled complete in factory. 12mm corrugated board boxes packing to protect the parts to avoid damaged. Retract system: including alloy wheels, oleo struts etc. Incorporate all of the latest design improvements. Anti bubble fuel tank 125ml Blue for jet turbine engines.